The development of specific process capability, such as maximum force clamping and high speed cutting, leads to an increase of productivity and quality compared to conventional machines. The handling, the machining process and the precision level of the machine are designed according to your needs. The FP-Series milling machines were designed for high speed cutting of aluminum. The most special feature of this horizontal milling machine ist it’s 15° tilt table, enabling one operator to position and clamp the work piece. In production, the chips fall vertically onto the scrap conveyor. For the production of rail road switches numerous screw holes are needed. It is exclusively for this process that we developed a 6500mm long machine tool including a high power, fast clamping system. The rail can be loaded by electric rolls and positioned on the clamping table. The special drill, which machines the holes and chamfers in and out, is operated by a high torque spindle, linked to the automated tool change system. A combination of all elements of factory automation technology, interlinked by handling robots. Case study: Food packaging machine: the food industry demands highest precision, speed and quality, whilst allowing lowest contamination. 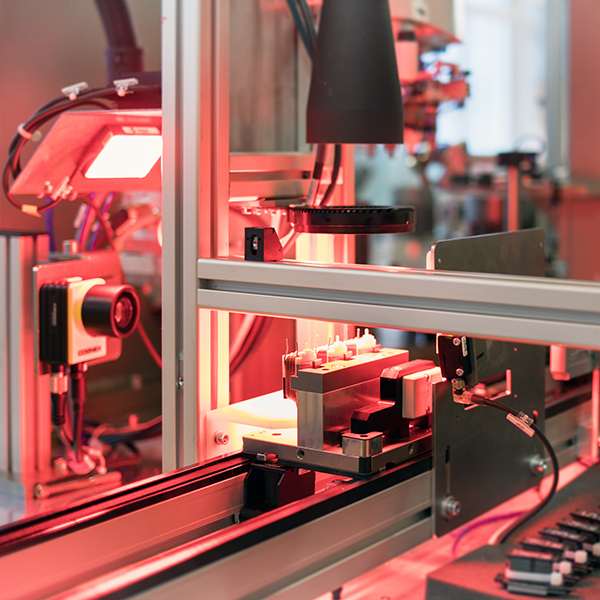 This fully automated line processes food packaging units and examines them on specific characteristics.